Women in technology face numerous challenges in their day-to-day work. If you would like to join other women in the field to discuss topics related to those challenges, AdaCamp is for you. This one-day LITA preconference at ALA Annual in Chicago will allow female-identifying individuals employed in various technological industries an opportunity to network with others in the field and to collectively examine common barriers faced. 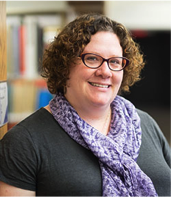 Margaret Heller is Digital Services Librarian at Loyola University Chicago. She works on web development, the discovery layer, digital collections, the institutional repository, and digital preservation. She also researches and presents about social justice in digital collections and issues for working parents in library technology. She enjoys working with students and new professionals, and only recently figured out how to beat her own imposter syndrome. Evviva Weinraub is the Associate University Librarian for Digital Strategies at Northwestern University. She provides leadership and advocacy for Information Technology, Digital Initiatives, Repository and Digitization Services, Metadata and Resource Discovery, User Experience, and Access Services. In addition, she serves as the co-Director of the Avalon Project. She holds numerous offices in library professional associations and projects including the American Library Association, IFLA, and the Fedora Project. She has published and spoken extensively on library management, open source development, user experience, and digital publishing. Thanks to support from our sponsors, LITA is offering several $500 travel scholarships. Look for application details very soon on the LITA Blog. Travel information will be sent to participants upon registration. Workshop space is ADA accessible. Please contact lita@ala.org regarding other needed accommodations. Note that you do not need to register for the ALA Annual Conference in order to attend LITA’s AvramCamp. You’ll need to use the regular registration process on the ALA Annual website, but once you’re logged in to the system you’ll have the option to skip full registration and select a ticketed event. Please contact alaregistration@compusystems.com if you run into any problems registering for just AvramCamp.